Friday night in Monaco saw the unveiling of an ambitious project, the Ultraluxum CXL trimaran, at a press conference on the yacht Lady Lola. The presentation was graced by a brief visit from HSH Prince Albert II, who is a supporter of the project as it will be built following the requirements of the Wood for Ever program, which is an initiative of the Prince Albert II of Monaco Foundation that encourages yacht builders to use only timber sourced from sustainably managed forests. The CXL concept is the brain child of Jean-François Ruchonnet, founding partner of Ultraluxum, and was developed by designer Jean-Jacques Coste of Coste Design & Partners. With a length of 48 metres, the sloop-rigged trimaran could become the largest multihull superyacht in the world. The concept's main innovation is its folding hull beams, which can reduce its overall width from 23 metres in a sailing configuration to 11 metres in harbour configuration. Seen on small boats in the 1970s this is not a new idea, but it is a first for a trimaran of this size, with the dual benefits of comfortable stability at sea with no heeling and easy access to harbours and marinas. Bureau Veritas classed, the CXL will be built in sandwich epoxy resin and carbon fibre, with an overall weight of 110 tons. 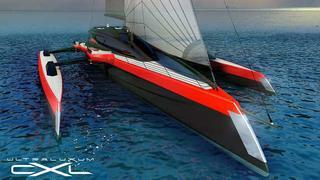 She will have a 55 metre mast and a total sail area of 1,200 square metres, giving top speeds of between 20 and 25 knots. Diesel-electric propulsion will be an option, enabling her to reach 15 knots under engines, with a 40 per cent reduction in fuel consumption compared to a monohull of the same size. The modern interior is the design of Coste Design & Partners and Ultraluxum's owner Jessica Sbaraglia, and will include Swarovski details and lighting products. Few details are currently known, but she will accommodate six guests in a master suite and two guest cabins, all en suite. The project is being managed by Eric Althaus of Althaus Yachting and Tamsen Yachts is the shipyard chosen to build this atypical project. Her construction could start in 2012, once a new owner has commissioned her.